If you’ve been following the saga of my Tiger Morse dress, you’ll be pleased to know that I have some answers for you! 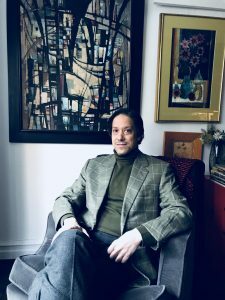 I met and chatted with fashion and art historian Alan Rosenberg, the author of a forthcoming book about Tiger Morse. He illuminated quite a lot of the dark spots in my understanding of the designer’s life, and even identified my mystery dress. You can read my love letter to the designer here, which features all my preliminary research. In a crunch? Here’s the gist: I found a dress in my vintage box designed by New York City designer Joan “Tiger” Morse in the 1960s. I did some research and found out that she was one of the first designers to open her own boutique, and quite possibly invented the light-up dress. My grandmother used to visit her boutique, Teeny Weeny, in the 1960s. Unfortunately, very few of her garments remain– the designer died of a heroin overdose in 1972, and few of her ephemeral dresses were built to last. She took her legacy with her. I was only able to find a few online sources that referenced the designer. One such source advertised the “Mod New York” exhibition at the Museum of the City of New York. As luck would have it, the exhibition was still on, and there was a lecture scheduled for the following week. Fashion historian Hazel Clark would be moderating a discussion with designers Andrea Aranow and Anna Sui and curator Phyllis Magidson. I attended, and did a write-up of the exhibition and lecture on Canvas And Crumpets. At the lecture, I asked the panel for advice. What could I do when my online resources had run out? What else did they know about Tiger Morse? Magidson assured me that, though the information was scarce, it did exist. Patience and determination would be my allies in this research quest. She also mentioned the name of a design historian and curator, Alan Rosenberg. He was the expert on Morse, she said. The name was familiar– I’d come across his work in my preliminary research and shown images he’d curated in a 2015 exhibition. Now this is where the story gets strange. A couple days later, I opened my computer to send Rosenberg an email and I found a message from him in my inbox. Apparently, the Mark Shaw Photographic Archive, who licensed photographs of Morse to me, had alerted Rosenberg about my blog. And this is because? The historian is actually writing a book about Tiger Morse! Some higher power has heard our prayers, and the avant-garde designer is finally getting the posthumous recognition she deserves. Last week I visited Rosenberg in his Chelsea apartment for a cup of tea. He told me about his research in a variety of fields- fashion, design, and art history. We share a passion for the intersection of these disciplines during the mid-20th century. Rosenberg’s introduction to Tiger Morse came in the form of a photograph of the designer– he was instantly smitten with her aesthetic and was eager to learn more about her story. In 2015, Rosenberg curated “Tiger Morse by Mark Shaw: Jet-Set Style Quest, 1962” at Liz O-Brien Gallery in New York City. The exhibition introduced viewers to the luxurious lifestyle Morse lived in the early 1960s, before her descent into addiction took over her life. In 1962, Morse was still operating her first boutique, A La Carte, on the Upper East Side. Her wealthy clientele included the likes of Jackie Kennedy and Jean Harvey Vanderbilt, and her designs were characterized by their expensive, foreign fabrics. 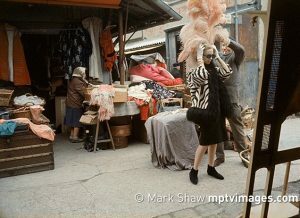 Morse and her photographer pal, Mark Shaw, approached LIFE magazine with a proposition: the two would jet-set around Asia on a fabric-buying spree, and the latter would photograph the adventure. The resulting photographs depict Morse in Benares, Kyoto, and Bankok. The exhibition included studio portraits of Morse in addition to the series for LIFE magazine, as well as images of Morse’s clients in her garments. Curated with nuance and ample contextualization, “Tiger Morse by Mark Shaw” offered NYC audiences a never-before-seen look at one of the most important designers of the 20th century. Rosenberg is currently working on a book about Morse, as well as a website to commemorate the designer. While you’ll just have to wait to learn all the secrets he’s uncovered, he did share with me a few factoids you’ll enjoy. He explained that Morse knew Dr. Feelgood– the doctor who spoon-fed amphetamines to celebrities and politicians in the 1960s– from the neighborhood. She introduced Dr. Max Jacobson (the doctor’s real name) to her famous friends– effectively getting her friends hooked on the doctor’s “IV-Specials.” Mark Shaw also died of an overdose, three years before Morse. The two likely spent much of their trip to Asia high on speed. Rosenberg also told me that Morse spent the last years of her life as a waitress at Max’s Kansas City in Union Square. He was quick to point out that not just anyone could be a waitress at the coolest spot in the city– you had to be someone. But her job there still demonstrates how quickly and how far she fell in the early 70s. It was a downfall characteristic of the period, Rosenberg explained. It was no longer cool to try so hard. Post-tea I pulled out my psychedelic pink dress for Rosenberg to examine. He immediately recognized it from a 1967 Bloomingdales advertisement he’d found in his research. (There may be little information online, but the historian has found hidden gems in newspaper advertisements and magazine articles). 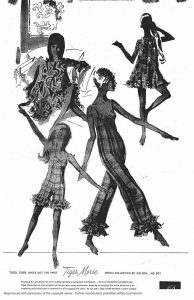 My dress is the swing dress at top-left, worn by the model perched on a chair. Even in black and white you can make out the mixture of round and angled geometric shapes. The text at the bottom of the ad reads, “the art-nouveau swing-tent of sheer voile in hot pinks, lime and white, $13. All in sizes P, S, M. Lingerie, 2nd Floor and all branches.” I’ve now learned that my “dress” is actually glamorized loungewear. I will continue to pretend that it is a dress and wear it in public. In all seriousness, this discovery is huge. Mr. Rosenberg informed me that he would like to include my dress in his book. It makes me enormously happy that this project has led me here; it introduced me to the expert on Tiger Morse, and has ensured that my dress will go down in fashion history. The story doesn’t end here. In-between cups of tea Mr. Rosenberg and I chatted about our related interests. We have both studied Constant Nieuwenhuys, though we focused on different aspects of his career. We are both intrigued by the surrealists, but have studied different artists. My conversation with Alan Rosenberg has inspired me to look in new directions, towards Tiger Morse’s clients and contemporaries.